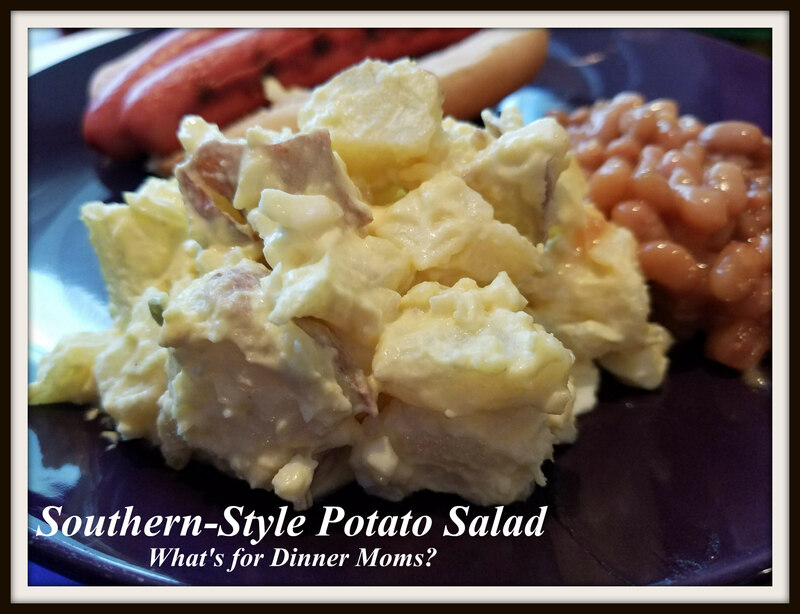 Southern-Style Potato Salad – What's for Dinner Moms? Summer picnics will be in full swing soon and this is one of our favorite potato salads. 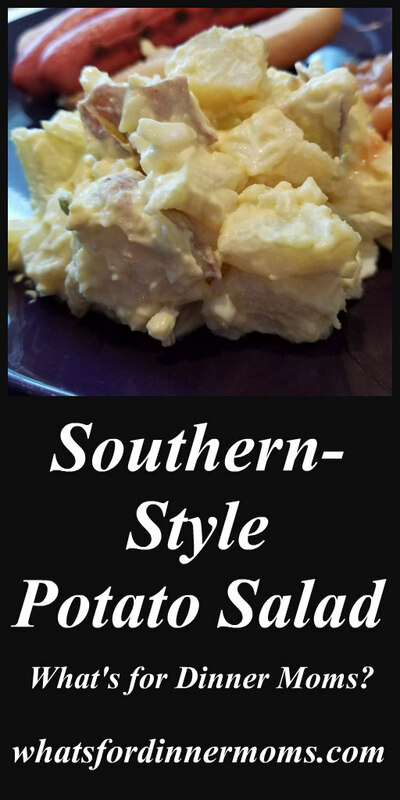 Southern-style potato salad tends to be creamier, smoother, sweeter than regular potato salad. Did you ever notice everything that is described as Southern-style is usually described using those words? Creamy, smooth, and sweet. Macaroni and cheese, pimento cheese, and chess pie come to mind quickly as examples of this. My daughter tends not to like mayonaisse based salads but she loves this one. I think the sprinkle of apple cider over the warm potatoes and the bit of sweetness from a tiny bit of sugar and the sweet pickle relish. Use your taste to make this how you would like it. If you tend not to like sweet salads cut out or cut down the sugar or relish. If you like them a bit sweeter add it all! We served the potato salad with grilled hot dogs and baked beans for the perfect picnic. Place potatoes in a large bowl. Cut the potatoes into bite-sized pieces. In a small bowl, mix together mayonnaise, mustard, sugar, and onion powder. Pour over potatoes and mix in well. Add relish and the chopped eggs. Mix in celery and onion if desired. Add salt and pepper. Taste and adjust spices as necessary. Cover with plastic wrap and refrigerate at least 4 hours to allow flavors to blend. This is definitely the kind of potato salad I like! This sounds great and I live Jayne south! I all already make it like this I need to add the sugar and vinegar and I know it’s delicous! It was so good! Thanks for sharing! Only difference I like dill relish in mine even though at times I’ve used sweet when I’ve been out of it but I’m definitely trying the vinegar. How can I go wrong here! Thanks again! I like sweet relish in mine too, and my macaroni salad. This sounds yummy! I think for my daughter it was the apple cider vinegar that helped. Both kids tend to stay away from mayonnaise based salads.